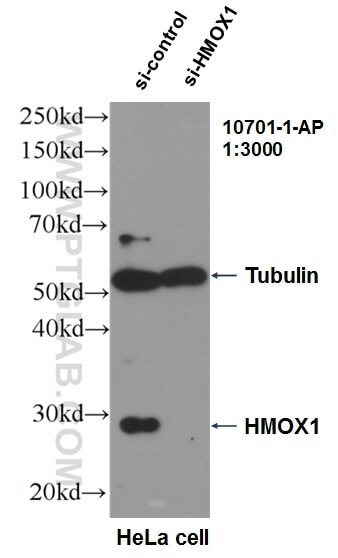 WB result of HMOX1 antibody (10701-1-AP, 1:3000) with si-Control and si-HMOX1 transfected HeLa cells. 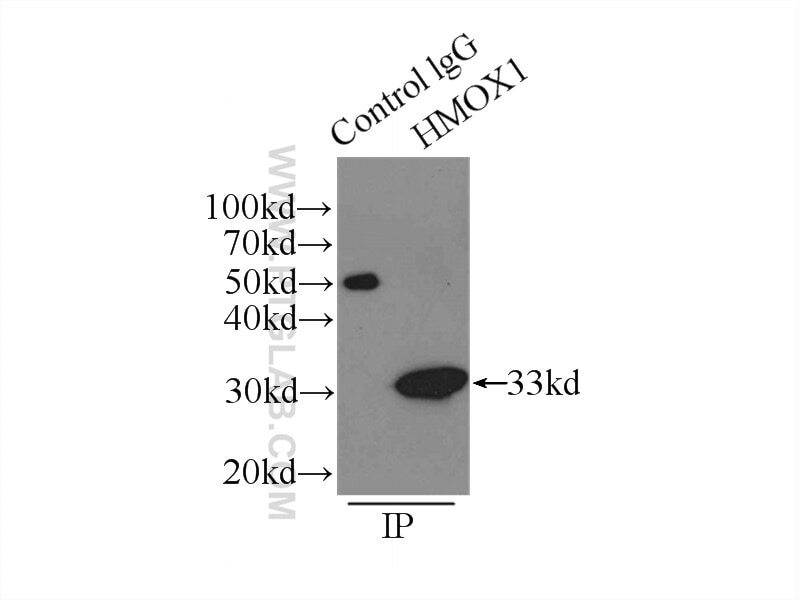 IP Result of anti-HMOX1 (IP:10701-1-AP, 3ug; Detection:10701-1-AP 1:1000) with HeLa cells lysate 3000ug. 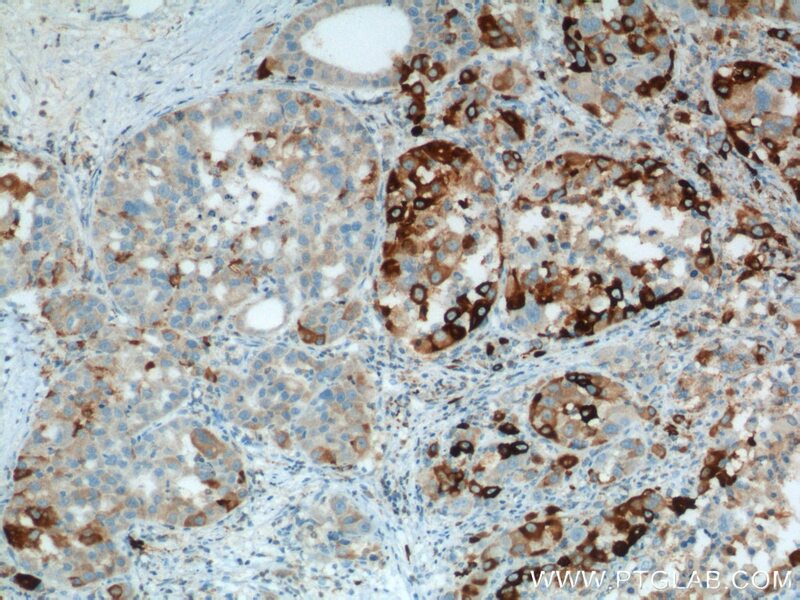 Immunohistochemical analysis of paraffin-embedded human liver cancer tissue slide using 10701-1-AP( HMOX1 antibody at dilution of 1:200 (under 10x lens). heat mediated antigen retrieved with Tris-EDTA buffer(pH9). 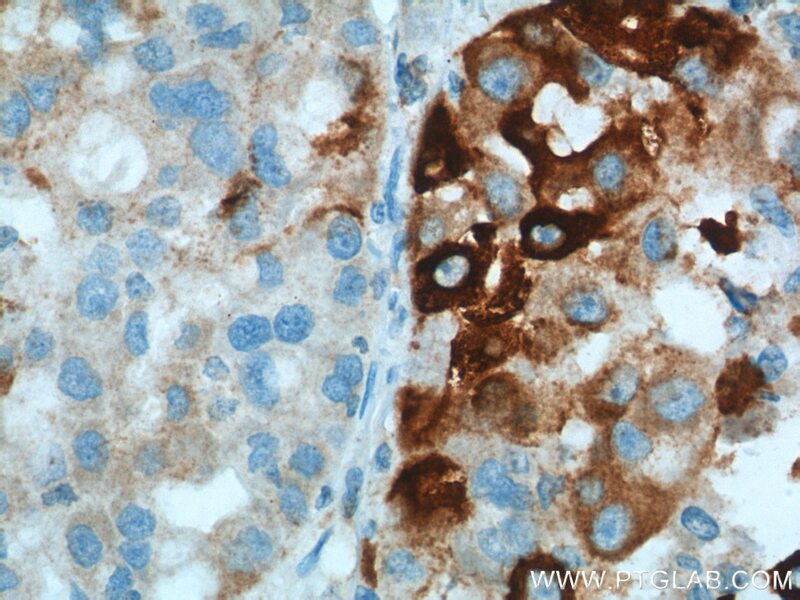 Immunohistochemical analysis of paraffin-embedded human liver cancer tissue slide using 10701-1-AP( HMOX1 antibody at dilution of 1:200 (under 40x lens). heat mediated antigen retrieved with Tris-EDTA buffer(pH9). Heme oxygenase (HMOX1) catalyzes the first and rate-limiting step in the degradation of heme to yield equimolar quantities of biliverdin Ixa, carbon monoxide (CO), and iron. It has 3 isoforms: HO-1 is highly inducible, whereas HO-2 and HO-3 are constitutively expressed (PMID:10194478). 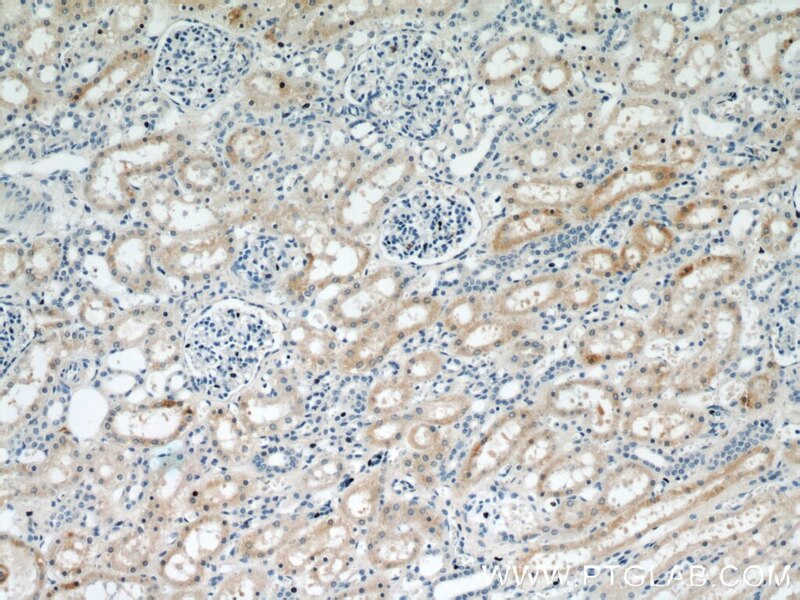 Heme oxygenase-1 (HO-1) is expressed in many tissues and vascular smooth muscle cells, and endothelial cells (PMID:15451051) and has been identified as an important endogenous protective factor induced in many cell types by various stimulants, such as hemolysis, infiammatory cytokines,oxidative stress, heat shock, heavy metals, and endotoxin (PMID: 11522663). 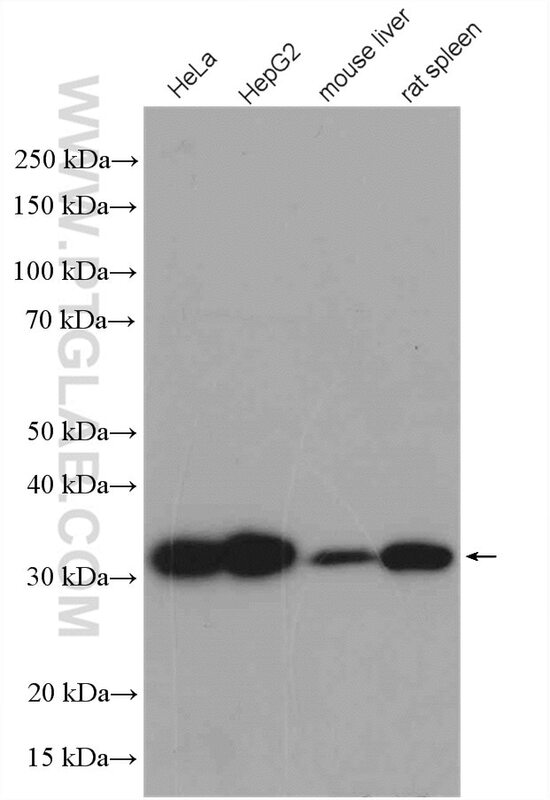 And the full-length HO-1 is very unstable and susceptible to truncation that generates an inactive, soluble form (28 kDa) (James R. Reed, Pharmacology, 535-568). 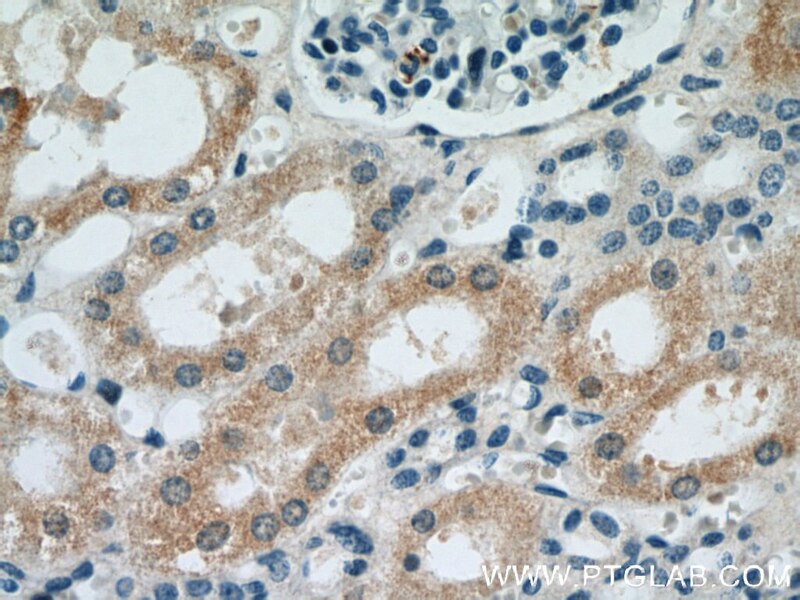 This antibody offers a good detection of HO-1 expression in LPS stimulated macrophages. 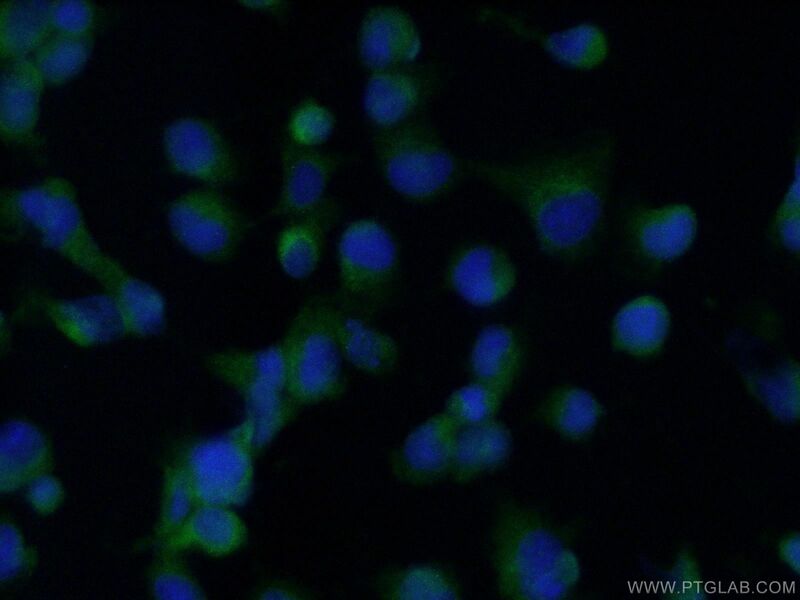 The HO-1 expression can be observed in the cells after 24h stimulation of LPS. Heme oxygenase-1 attenuates IL-1β induced alteration of anabolic and catabolic activities in intervertebral disc degeneration. α-Lipoic Acid Promotes Neurological Recovery After Ischemic Stroke by Activating the Nrf2/HO-1 Pathway to Attenuate Oxidative Damage. Heme oxygenase-1 prevents heart against myocardial infarction by attenuating ischemic injury-induced cardiomyocytes senescence. 14-3-3ζ inhibits heme oxygenase-1 (HO-1) degradation and promotes hepatocellular carcinoma proliferation: involvement of STAT3 signaling. Hepatoprotective effects and structure-activity relationship of five flavonoids against lipopolysaccharide/d-galactosamine induced acute liver failure in mice. Nuclear factor (erythroid-derived 2)-like 2 antioxidative response mitigates cytoplasmic radiation-induced DNA double-strand breaks.